After early morning indications were most severe would be to south - extreme southern IL, MO bootheel, AR - (Projected CAPE and helicity quite high according to RUC) - things began to change abruptly late morning. Satellite pics and TWC maps clearly showed surface low over NW MO with trailing cold front, and system becoming negatively tilted in NW MO. The gunge over central and eastern MO was rapidly burning off, and western MO was now clear - temps approaching 80 with dewpoints 65-70. In addition, the 15Z RUC was predicting very high CAPEs of 3000-5000 with SRH 150-300, with the highest CAPEs moving from north central MO at 21Z to NE MO/west central IL by 0Z. At 16:30Z, SPC extended the slight risk area north and westward to include most of MO and IL, after earlier including only southern MO and extreme SW IL. I decided to target north central MO between Macon and Chillecothe, and try to work east to around Quincy ahead of the storms. 1:30: Red box issued for central and northern MO and south central and SE IA, valid until 7:00 pm. I have cleared the gunge/debris from morning storms and it is now getting hot and sticky, brisk SE wind. 1:50: Passing Hermann exit, sky now filling with ACCAS and elevated TCU. 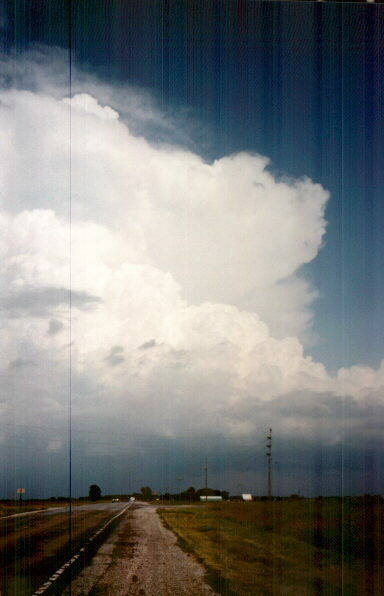 An elevated storm goes up to the south; towers visible to NW. I decide to stop at Kingdom City Petro for data check. 2:30: Get gas, check data at Petro at Kingdom City. I had become concerned I might get too far west and get behind the storms and have to play catch-up - should I cut north there rather than at Columbia, as originally planned? Checking radar, I see main line of storms well NW of COL, with isolated storms ahead of it. (Note: Internet connection here is 25 cents a minute. I got radar and updates on warnings and watches for only $1.78 - cool!) I decide it's OK to proceed to COL. As I get close I see storm with hard tower going up to N.
3:00: Heading north on U.S. 63 from COL, approaching the storm. About 10 mi. 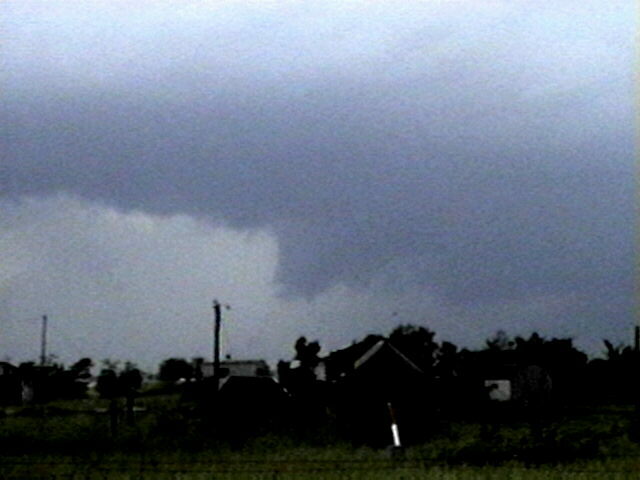 north I see distant lowering to NW; I stop to video - here is a video snap of the wall cloud well to my WNW. 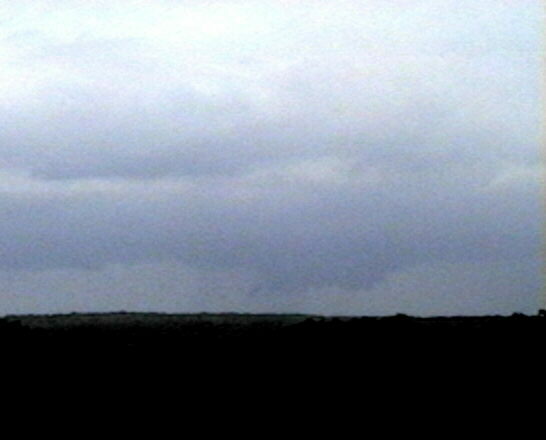 The narrow lowering on the left of the wall cloud is detached and is probably scud. After a few minutes I decide to move closer. Over the next half hour I pursue this storm north to around Clark, with several stops to photograph and video. It intermittently produces wall clouds and scuddy lowerings; one possible brief funnel under distinct wall cloud as it passes across road about 4 or 5 miles to my north. Here is a video snap of the wall cloud a couple minutes after the possible brief funnel and just after it crossed the road to my north. Now I've got no east option, but I'm not worried because I think main line is still to NW. Wrong! 3:30: It looks less and less interesting to west - mostly small mushy CB; all the good stuff is to east; including the storm I had been on, really getting backsheard with rock hard towers. I decide I am too far west and go after this storm to the east on U.S. 24. The updraft towers are again rock hard and I see one build into the overhanging anvil and emerge out the top of the storm a few minutes later as an overshoot - very impressive! I am close behind the storm as I approach Mark Twain Lake; it intermittently forms wall clouds like this one on the west and south edge of the core. 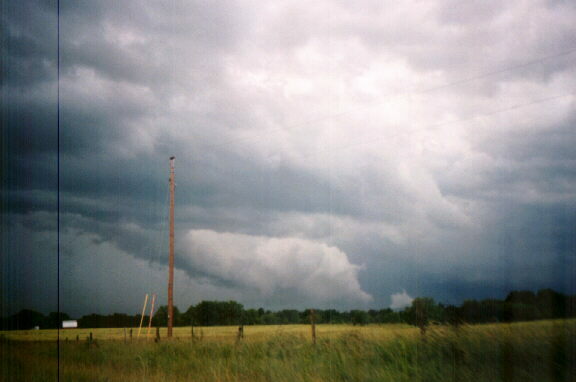 Occasional hail shafts are visible as white streaks; no sun is hitting them. I didn't know it due to poor radio reception and no NWR reception in this area, but SVR is now issued on this storm. (The warning can be seen here.) The storm produced 1-inch hail near Palmyra. The LSR can be seen here. Around 4:30: I get word of a TOR on a storm near Lake of the Ozarks. My storm has done nothing but form and dissipate non-rotating (or minimally rotating) lowerings for an hour and a half and is now showing signs of weakening, so I decide to bail south to intercept the other storm. There are other storms to my NE, but only one Mississippi River crossing, at Quincy, and I doubt I can catch up with these storms. I drop south on 107 to connect with 19 and head S for intercept of Lake of Ozarks storm near Montgomery City, but waste 10-15 minutes when I make wrong turn based on a sign that did not in fact show the most direct route to Mo route 19. Eventually I get there and head south. 5:25: SVR issued for Montgomery County on this storm (actually it is for a line of severe storms, but I didn't hear that part); 5 minutes later I cross into Montgomery Co. I can see obviously multicellular structure of storms, but updrafts are all on SW side of northeastward moving storms, with precip falling downshear - I can see 3 or 4 towers up and down the line, all quite hard, rising into backsheared anvil with some mammatus. Given this structure, I hope for some imbedded supercells. I briefly go SW of Wellsville on back road to get better position on an updraft, but notice a wall cloud to East so I backtrack to 19 and proceed south. It dissipates, but later (I am not totally sure whether north or south of Montgomery City; however the timing would put it somewhere between 5:45 and 6:00) I notice an narrow white tubular structure under updraft that appears to reach ground - but it is far east of me (at least 10 mi) and I can't tell if it is scud, a funnel, a tube, or what. It disappears (in the rain?) in less than a minute, so I assume it's nothing of significance. A few minutes later I notice another wider, more scuddy looking front-lit lowering, also far to the east - but again it quickly disappears. I had no time to photograph or video either of these features, and am not sure in the low contrast that they could have been seen anyway. Around 6:00: I reach I-70 and decide to pursue the storm to the east. Sick of playing catch-up, I think my only hope of seeing anything is to get ahead of storms so I can get some backlighting. 6:20: Stop at truck stop at Jonesville hoping for data, but no Internet terminal. In parking lot, I hear about TOR on the storm I had been after; doppler indication of a tornado 4 miles west of Hawk Point (or about 15 east of Montgomery City) at 5:48. Could it have been that narrow white lowering I saw?? Whatever I saw, there was no tornado reported in this area. The warnings that were issued on this storm can be seen here. A little farther east, near Troy, MO, the storm did produce 55 mph winds and nickel-size hail. The LSR can be seen here. 6:30: After a brief stop to look at a cloud base SW of Warrenton, I head east on I-70 to try to get ahead of the storms. I get an hour of white knuckle driving in blinding rain with occasional flooded road - even at reduced speed, I hydroplaned 2 or 3 times and also was abruptly slowed a number times as I hit water on the road. Visibility dropped to a few hundred feet at times, with CG zapping down all around. In one squall north of St. Charles on I-370 I am hit by perhaps 40 mph gusts from the SW. Intermittent blasts of blinding rain continue until I'm in north St. Louis County on I-270 (a very built-up suburban area, for those of you from outside the St. Louis area). The multicellular structure is obvious as I hit blinding squalls, then lighter areas where I can see updrafts and rain cores around me. This continues until a particularly strong cell with more CG than the others crosses the road ahead of me somewhere around MO route 367. I poke under the updraft just before the Mississippi river and I'm finally ahead of the storm - but it is around 7:30 and light is fading fast. Still, I decide to cut north on IL route 3 toward Alton to track the storm, which has a slight lowering under its flanking line. As I get closer to where 3 crosses IL route 143, I notice what looks like a wet RFD wrapping around the base of the updraft, and a shelf cloud froms ahead of it and sweeps over me with a stong blast of wind from the west - maybe 40 mph - and more blinding rain. About this time I hear a SVR for this storm; the warning can be seen here. The storm produced wind damage in Alton, Godfrey, and Bunker Hill. The LSR can be seen here. 8:00: As I head home toward Edwardsville on IL 143, I cross under the shelf cloud and notice new updraft to south, passing over campus - so I drop south to north edge of SIUE campus to watch. See what may have been a slight lowering or maybe just the linaer updraft base continuing to SW - but it has newly-developing rain core to its north and as CG zaps down around me - maybe a dozen strikes within a mile in a few minutes - the blinding rain sweeps over me once more. Here is a video snap taken while I was in this location. Intersting point - despite blinding rain over and over again, I encountered neither severe wind nor any significant hail. Peak gusts I encountered were probably 40 mph. Howerver, severe weather occurred with all 3 storms I was on, as shown in the LSRs below. Most of the tornadoes that occurred were in west-central and central IL, including an area I like to chase just north of the St. Louis area in Macoupin and Montgomery Counties. Unfortunately, one person was killed when a tornado hit a rest area on I-55 near Raymond between here and Springfield, IL and overturned semi trucks. 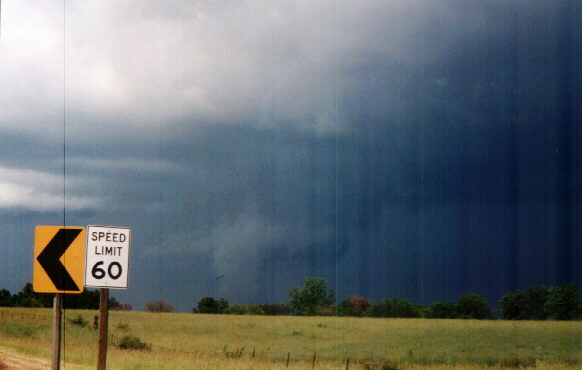 This tornado was rated F2 and was on the ground for about 10 miles. A second tornado developed from the same storm near Harvel and went on to cause damage in Morissonville, 12 miles northeast of the rest area. 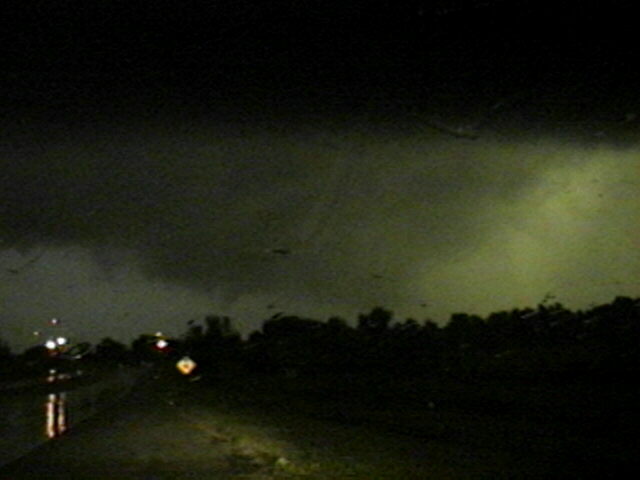 Another tornado caused F3 damage in St. James, MO, along I-44 to the south of the area where I was chasing. It was one of six tornadoes confirmed by NWS damage surveys in Phelps and Denton Counties. 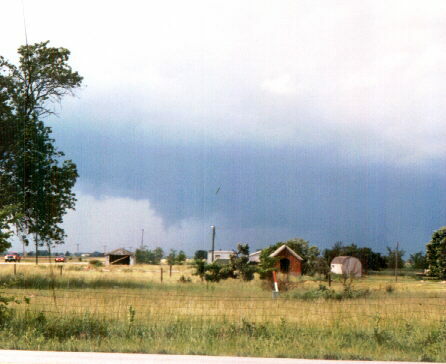 Video of both the Raymond and St. James tornadoes appeared on St. Louis television. Both were large and impressive, and the Raymond one appeared to be at least briefly multi-vortex. In retrospect, I made two mistakes on this chase - I targeted too far to the northwest and, when I looked at the radar in Kingdom City, I underestimated the speed with which the storms would move/propagate to the east. The consequence is that I played catch-up all afternoon and was out of position on most of the storms. I thought the best action would be closer to the low, which would have been from north central MO to near the IA line and into NW IL. But in fact it was farther south, probably because that's where the best mid-level jet moved in from the SW. I knew that with the very high dewpoints I could be dealing with multicell and/or HP storms and that visibility could be a problem. One thing that made this a difficult chase is that there were just TOO many storms - no obvious one to chase. But it was still an interesting day and I think I learned a few things from it, like don't overshoot the storms by going too far west then playing catch-up. SPRING... MOVING NORTHEAST AT 30 MPH. TORNADO 4 MILES WEST OF HAWK POINT... MOVING NORTHEAST AT 30 MPH. SEVERE THUNDERSTORM NEAR ALTON... MOVING EAST NORTHEAST AT 35 MPH.